Take It to Your Leaders: SpaceX's Futuristic Dragon Spaceship Invades D.C.
SpaceX's manned Dragon capsule made its way to Washington, D.C., for a press event on June 10, 2014. WASHINGTON — Call it a spaceship soiree. 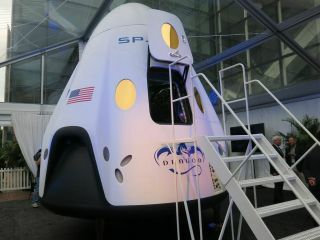 SpaceX, a frontrunner in the commercial space race to launch Americans off the Earth, brought its new manned Dragon capsule to the nation's capital this week to showcase the futuristic spaceship. Elon Musk, SpaceX's billionaire CEO and chief designer, introduced the new manned Dragon V2 spacecrafthere Tuesday (June 10) in an event that felt more like a cocktail party than a spaceship unveiling. Members of Congress, astronauts and the press had the chance to step inside the Dragon V2, which aims to ferry seven astronauts at a time to low-Earth orbit and beyond. The interior of SpaceX's manned Dragon capsule. The spaceship can fit up to seven astronauts on trips to low-Earth orbit. "We wanted to create a great spacecraft for the United States that would really serve the needs of the space program, [both] in terms of what NASA needs and in terms of what commercial space travelers want to do," Elon Musk told reporters. "This is a much higher-level technology than anything the Russians are doing." With an egglike shape, soft-white exterior, and SpaceX's name and stylish blue dragon logo emblazoned on its surface, the Dragon V2 spacecraft appears much more modern than the Apollo capsules. The gold-tinted windows and vertically opening door add futuristic touches. On the inside, the capsule is elegant but sparse, with the seven seats facing upward beneath a large, flat-panel display, which serves as the craft's only controls. Reclining in one of the seats, you could just as easily be visiting the dentist as blasting into orbit. The craft had no bathroom at the time, but SpaceX plans to install one, said one of the Dragon's chief engineers. Elon Musk (left) and senator Bill Nelson (D., Fla.) stand atop the stairs before entering the manned Dragon capsule on June 10, 2014. Asked about his favorite feature of the new spacecraft, Musk told Space.com, "The biggest thing is that it's capable of precise propulsive landing — you can land and put it back on a rocket and take off right away." Spacecraft that splash down in the ocean or land out in a rocky desert can't be flown again very easily, compared with the reusable Dragon, Musk said. "This really has the ability to revolutionize spaceflight." The event's VIPs included senator Bill Nelson (D., Fla.) and congressmen Ken Calvert (R., Calif.), Dana Rohrabacher (R., Calif.) and Dutch Ruppersberger (D., Md. ), as well as astronaut Michael Lopez-Alegria. A veteran of three space shuttle flights and one ISS mission, Lopez-Alegria said he thought the capsule looked very modern — "it looks like an iPhone," he said. SpaceX brought the Dragon here to show politicians and taxpayers what they might be buying, said Musk, in his characteristic matter-of-fact tone. Staff writer Tanya Lewis sits inside the manned Dragon capsule on June 10, 2014. "I haven't seen anything proposed that would match the Dragon Version 2 on a technology basis," Musk said. "This is really taking things to a new level." Follow Tanya Lewis on Twitter and Google+.Follow us @Spacedotcom, Facebook and Google+. Original article on Space.com.